Why not take your dog with you in the car on a warm day? With BreezeGuards®, your dog can stay safe and comfortable in your car with the windows down! MuttManagers, LLC, founded by Sue Stipanovich, manufactures pet friendly automotive safety products. Our BreezeGuards® are custom made cage panels or “screens” that fit your specific vehicles window opening. All of our products are custom made from welded steel wire mesh and have a black powder coated finish. They install from the inside of the vehicle which allows for free movement of the window glass. A pair of these units allow for a cross breeze which will keep your vehicle within a few degrees of the outside temperature. We are very committed to making sure the BreezeGuard® screens will always be made here in the USA. A BreezeGuard® will protect pedestrians walking near the vehicle and will also protect dogs from people tempted to pet or feed your dogs. BreezeGuard® allow for the window to be completely open thus providing any dog as much air as the window opening will allow. These screens allow for circulating air and this can have a natural calming effect for canines and humans alike. Their BreezeGuard screens are sturdy and will likely outlast the life of the owner’s vehicle. They were designed to be easily installed and removed at the whim of the customer. They also were designed to not alter the resale value of the customer’s vehicle. There is nothing like the BreezeGuard screen sold to civilian individuals at this time. There are pet guards sold with police vehicles but they require a permanent installation which would alter the resale value of the vehicle. What Do Customers Say About BreezeGuard® ? Order BreezeGuards® For Your Vehicle Today! Don't leave your dog at home! 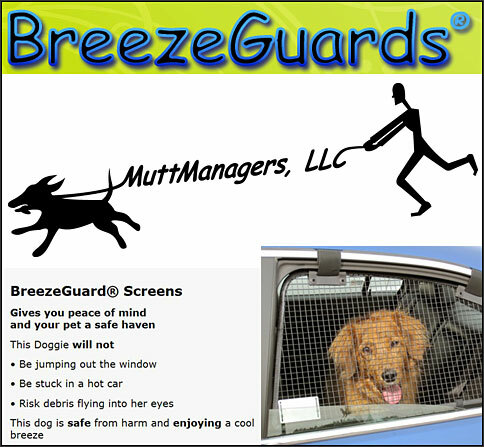 BreezeGuards® Screens allow your dog to travel with you safely and in optimal comfort. Each of our BreezeGuards® are custom made for your vehicle, call us today for more information and to get started!